The talk will focus on the fundamental human values that are the building blocks of an engaged and compassionate world. The Dalai Lama will outline his comprehensive vision of secular ethics, its underlying principles, and the urgent need to embrace such a system in today’s increasingly connected and globalized society. A question-and-answer session following the lecture will be moderated by Paul Root Wolpe, director of Emory's Center for Ethics. 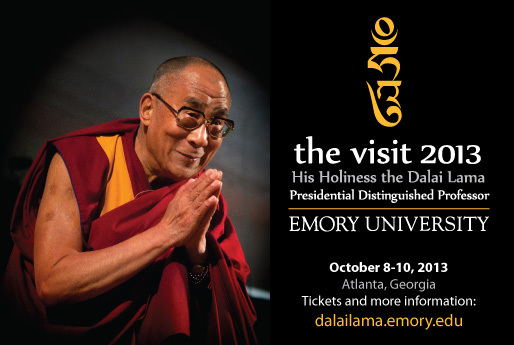 A panel discussion on "Secular Ethics and Education," featuring the Dalai Lama alongside top scientists and educators, from 1-3 p.m.
Panelists will examine the applicability of secular ethics in modern education through the lens of evolutionary biology, neuroscience, and educational policy and curricula. Discussion will include the implications of secular ethics for the U.S. education system, strategies of implementation, and potential benefits.